Welcome to the Featured Artist of the Week. This week I wanted to try something different. Last week I talked about how wonderful the artist was and sent you a link to her blog. This week I want to introduce you to the artist. I sent her a few questions and she has answered them as only a true artist can. Stacy Rowan has a passion for art that very few possess and it has driven her to create some of the most beautiful works of art you will ever see. Her blog, Stop and Draw the Roses, has been a huge inspiration for me over the past few months. I am including two images of her artwork here, just to whet your appetite. After reading her interview, make sure you click on one of the images to visit her site. I remember when I was probably around 10 years old drawing a copy of a Girl Scout cookie poster. I worked hard to duplicate the poster on my piece of notebook sized paper. When I was done I was proud of my result so I called my older sister in to see my drawing. She took one look at it and accused me of tracing the image even though my drawing was much smaller than the original poster! I guess that means my drawing was a success! Luckily, my sister is much more supportive of my art now. I don't have just one favorite. I love working in watercolor and when viewing other artists' paintings I always seem to be most drawn to watercolors. It is great for capturing the play of light on an object because its transparent nature can be used to create a wonderful glow. Watercolor painting requires a lot of planning since typically the white of the paper is reserved for highlights, and since making changes or corrections can be difficult. The challenges which watercolor presents play well to my analytical side. About 18 months ago I started working with charcoal and was really surprised by how much I also enjoy this medium. The ease with which a charcoal drawing can be changed gives me more freedom to experiment. Also I enjoy the process of starting with paper that has been toned to a middle value and then adding charcoal to achieve the darker values and subtracting (erasing) charcoal to create the light values. It is a different process from how I work with watercolors, but exciting in its own right. How has being an artist effected your life? Art gives me a challenge. I am always learning, trying to improve, wondering how I can create what I see on paper. I have so many ideas for paintings - new subjects or techniques that I want to try. It's exciting and motivating. At the same time, art provides a reassuring constant in my life. 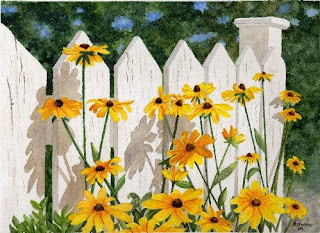 When I sit down to draw or paint, and I find that zone where I lose track of time and tune out the outside world, it is a bit like visiting with a good friend and it provides a sense of normalcy no matter what else is going on in the other areas of my life. Who is the artist that you admire the most? A tough question. There are so many artists out there creating wonderful art, not to mention all the masters who achieved things with their art that most of us can only dream of. But if I am forced to choose one artist, I would choose James Toogood. I've had the pleasure of taking two workshops with Mr. Toogood. 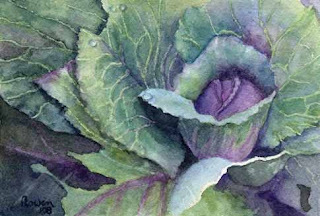 He not only creates beautiful, detailed watercolor paintings, but also has an extensive knowledge about watercolor pigments and painting and he generously shares this knowledge in his workshops. I admire this combination of artistic skill and technical knowledge. If you could tell the world only a single thing about yourself, what would it be? I would tell them that with art I have found a true joy in life and my life is better for it. I'd also recommend that they find something they love or feel passionate about and find a way to make it part of their life. Michael, thank you so much for featuring me this week. I am truly honored! I'm a big admirer of Stacy's work and I really enjoyed reading a little more about her here. Thanks!